Yemen's southern city of Taiz – scene of mass protests demanding the resignation of President Ali Abdullah Saleh - is facing an increasingly serious humanitarian situation, with dozens killed and injured, and limited access to water, health and education after several days of fierce fighting. Unsafe roads have interrupted the movement of water trucks in the city since clashes erupted on 29 November between government forces and an armed opposition that supports the civilian protesters. Taiz, a water-scarce city, relied on trucked-in water before the conflict. "At the moment, we don't have even a drop of water at home,” Abdulqadus al-Maqtari, who has been waiting for water for more than a week , told IRIN. “The toilet is blocked... It is becoming extremely difficult for us to relieve ourselves. We have to wait until it gets dark to relieve ourselves outdoors." Several hundred families in the neighbourhoods of Beer Basha, al-Hasab, Zaid al-Moshiqi and 60-meter Street have been living this way for the past few days. The UN says 22 people have been killed and 83 injured in intense fighting since 1 December. Sultan al-Samai, a member of parliament from Taiz, said indiscriminate shelling of neighbourhoods was the cause. Fighting between government and opposition gunmen has continued, despite a deal signed last month in which Saleh agreed to hand over power to Vice-President Abdrabuh Mansur Hadi within 30 days. The deal also stipulated that elections would be held within 90 days, with a new interim government to run the country until then. Some government forces have been pulled back since 6 December, but both sides still have troops spreading into some neighbourhoods. Families are resorting to unhealthy coping mechanisms, such as consuming water stored in contaminated tanks, and poor sanitation practices. 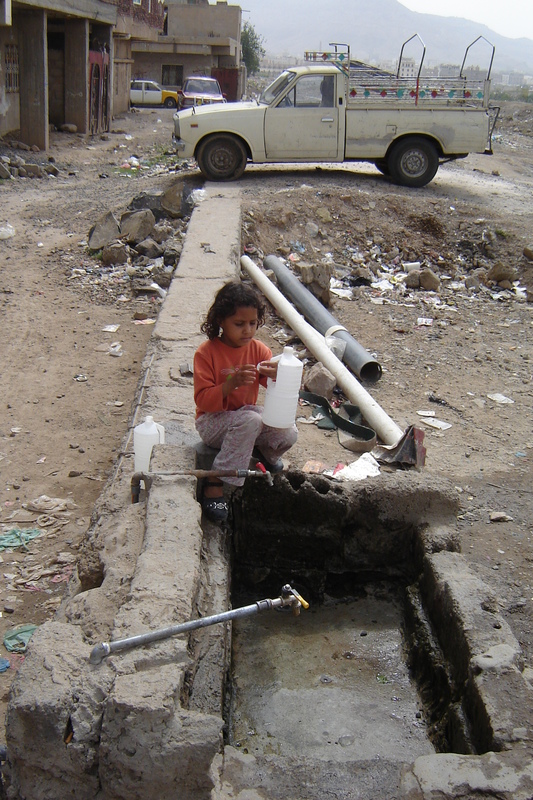 If the water supply remains interrupted much longer, cholera and other water-borne diseases are likely to spread, said Abdullah Mursid, head of the Epidemiology Surveillance Department in Taiz governorate. Public hospitals in Taiz have been running short of medicine and medical supplies due to insecurity and lack of funding amid the ongoing political crisis, said Baligh al-Thwari, head of the government’s Medical Performance Monitoring and Follow-up Department in Taiz. "Hospitals are incapable of treating the injured, nor are they prepared to cope with any potential spread of water-borne diseases," he said. The International Committee of the Red Cross (ICRC) said there were also “worrying reports” of injured people being unable to reach medical facilities, and of facilities being attacked and damaged. On 5 December, the Human Rights Information & Training Center (HRITC), a rights group based in Taiz, appealed to aid agencies to intervene and "rescue the Taiz population from a potential humanitarian catastrophe". The humanitarian situation has been deteriorating since the first day of December due to the unprecedented shelling, insecurity and lawlessness in the city, the statement said. "Hundreds of thousands of people will be affected if no humanitarian interventions are made to save civilian lives," HRITC warned. According to Nabil al-Basha, a municipality officer in the city, bakeries and groceries have closed in many neighbourhoods, most notability in Beer Basha and al-Hasab. "Dozens of critically injured cases remain without access to necessary medication [due to insecurity]," Al-Basha told IRIN. The UN Children's Fund (UNICEF) said three children had been killed and seven injured in the latest round of violence in Taiz. Access to basic social services is increasingly limited and schools and hospitals have been occupied or come under attack, depriving more than 100,000 children of access to schooling or healthcare, UNICEF said. The UN High Commissioner for Human Rights, Navi Pillay, has voiced concern about the deteriorating situation, despite the peace deal. “Unarmed civilians, including very young children, have been shot and left dead or with serious injuries,” Pillay said. “It is appalling and extremely disappointing that despite the successive deals and ceasefires, government security forces continue to use live ammunition against unarmed protesters. Mass pro-democracy protests and fighting between government forces and opposition tribesmen in other cities, including the capital Sana’a, have killed hundreds of people. In addition, some 400,000 people have been displaced by separate conflicts in the north and south of the country and widespread malnutrition, which affected more than one-third of the Yemeni population before the political crisis, is feared to be rising. Humanitarian partners will expand their programmes next year to target 3.8 million people needing assistance, requesting total funding of US$452 million for 2012.